The American crow is a large black bird with expansive populations across much of North America. Except during molting when their feathers can appear brown, this bird is entirely black from its bill to its feet. The American crow has long legs, a thick neck and a heavy, wide-set bill. Their wings are broad and in flight the feathers of the wingtips fan out like fingers. Their tail is fairly short and ranges between a rounded and squared-off end. Their flight style is unique in that they tend to flap continuously and slowly with almost no gliding. American crows are common in just about every kind of North American habitat except for the deserts of the southwest and dense unbroken forest. They thrive most easily around humans and human constructions like cities, lawns, parking lots, highways, roadsides, golf courses and garbage dumps. However, they are highly adaptable birds and can also be found in open fields and woodlands, marshes, campgrounds and forest edges. Like many crow species, the American crow will eat just about anything including earthworms, a variety of insects, many different kinds of grains, seeds, nuts, fruits and berries. They will also eat small animals like mice and a host of aquatic animals including fish, mussels, clams, turtles and crayfish. The American crow is also an occasional scavenger and will eat carrion and other roadkill, although it doesn’t make up a large percentage of their diet. Despite their large beaks, they are unable to break open even soft skin and so rely on other animals to tear open carcasses. 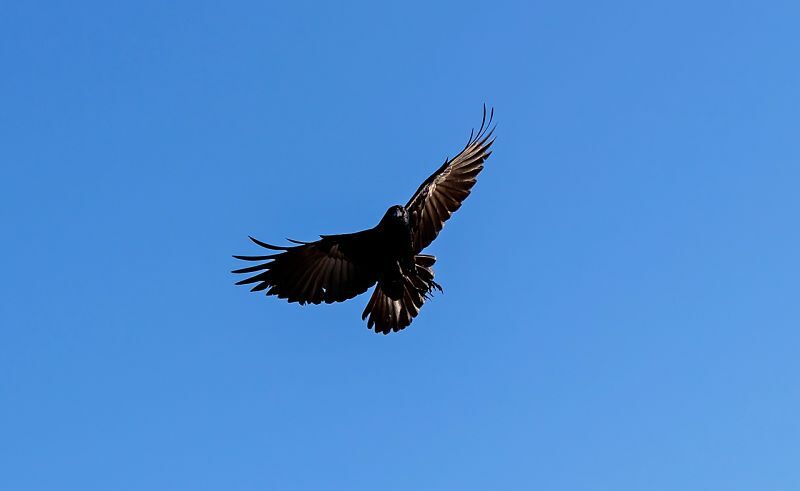 The American crow has been know to follow birds to find their hidden nests and will feed on eggs and nestlings of many bird species including sparrows, robins, jays, terns, loons and eiders. Crows will also capture and kill exhausted migrating songbirds at the end of long flights. Stealing food from other animals is also a common feeding tactic of the American crow. One case showed a group of crows distracting an otter to eat its fish and another showed crows following a group of ducks that were herding minnows into shallow water, then stealing those fish. American crows are also tool users, using cups to carry water, sticks to extract food and dropping different items like pine cones as defense tactics. The American crow is an exceptionally social creature and often forms flocks of thousands of individuals. During the winter, crows congregate in even larger groups to create communal roosts which can reach numbers of more than two million birds. In some cases, the geographic location of these roosts have been established for more than 100 years. The noise and mess associated with these mass flocks often creates tensions between humans and crows. Even when people have tried dynamiting the roosts, the crows always seem to come back. Crows are also very aggressive and will work together to mob humans and large birds of prey like hawks, owls and herons. Unlike many other birds, the American crow does not begin breeding until at least two years of age and often won’t begin breeding until nearly four years. During this time before breeding, young crows will often stick with their parents and help raise the other young for a handful of years. Typically, a crow family consists of about 15 birds with young from up to five different breeding years. Many crows maintain a consistent territory year round, but others will head to different flocks temporarily to explore dumps, agricultural land and other mass food sources. Often, they will leave during the day to take part in these other flocks, but return to their own roosts and territory at night. When it comes to nesting, both male and female crows build the nests and care for their young. Their nests are typically hidden in nooks near tree trunks, or conversely, along a horizontal branch near the top third of trees. They prefer evergreens but will nest in deciduous trees when needed. The American crow first composes its nest of twigs, then creates an inner cup lined with pine needles, weeds, soft grasses, animal fur and other soft materials. The nests can range any where from six to 19 inches across and four to 15 inches deep. The female American crow will lay roughly three to nine eggs with up to two broods in a season. Together the birds will incubate the eggs for 16 to 18 days and care for the nestlings for another 20 to 40 days. The babies are born naked except for a few specks of down and the whole family works together to raise the young. Between 1966 and 2014, the American crow was considered to have a stable breeding population of nearly 27 million. Eighty-eight percent of this population spends some of the year in the U.S. and 37 percent spends part of the year in Canada. The American crow population took a large hit in 1999 when West Nile Virus was introduced to the U.S. The birds are incredibly susceptible to this disease, with every infected bird dying within a week of disease contraction. Some populations were affected more severely than others. Hey Buddy!, I found this information for you: "The American Crow". Here is the website link: http://backyardbirdingblog.com/american-crow/. Thank you.